Pilots of single-engine airplanes are already familiar with many performance “V” speeds and their definitions. Twin-engine airplanes have several additional V-speeds unique to OEI operation. These speeds are differentiated by the notation “SE” for single engine. A review of some key V-speeds and several new V-speeds unique to twin-engine airplanes are listed below. VR—rotation speed—speed at which back pressure is applied to rotate the airplane to a takeoff attitude. VX—best angle of climb speed—speed at which the airplane gains the greatest altitude for a given distance of forward travel. VXSE—best angle-of-climb speed with OEI. VY—best rate of climb speed—speed at which the airplane gains the most altitude for a given unit of time. VYSE—best rate of climb speed with OEI. Marked with a blue radial line on most airspeed indicators. Above the single-engine absolute ceiling, VYSE yields the minimum rate of sink. VSSE—safe, intentional OEI speed—originally known as safe single-engine speed, now formally defined in Title 14 of the Code of Federal Regulations (14 CFR) part 23, Airworthiness Standards, and required to be established and published in the AFM/POH. It is the minimum speed to intentionally render the critical engine inoperative. VREF—reference landing speed—an airspeed used for final approach, which adjust the normal approach speed for winds and gusty conditions. VREF is 1.3 times the stall speed in the landing configuration. Figure 12-1. Airspeed indicator markings for a multiengine airplane. Unless otherwise noted, when V-speeds are given in the AFM/POH, they apply to sea level, standard day conditions at maximum takeoff weight. Performance speeds vary with aircraft weight, configuration, and atmospheric conditions. The speeds may be stated in statute miles per hour (mph) or knots (kt), and they may be given as calibrated airspeeds (CAS) or indicated airspeeds (IAS). As a general rule, the newer AFM/POHs show V-speeds in knots indicated airspeed (KIAS). 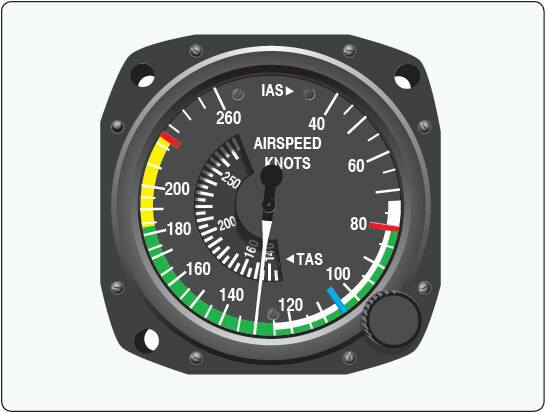 Some V-speeds are also stated in knots calibrated airspeed (KCAS) to meet certain regulatory requirements. Whenever available, pilots should operate the airplane from published indicated airspeeds. With regard to climb performance, the multiengine airplane, particularly in the takeoff or landing configuration, may be considered to be a single-engine airplane with its powerplant divided into two units. There is nothing in 14 CFR part 23 that requires a multiengine airplane to maintain altitude while in the takeoff or landing configuration with OEI. In fact, many twins are not required to do this in any configuration, even at sea level. The current 14 CFR part 23 single-engine climb performance requirements for reciprocating engine-powered multiengine airplanes are as follows. More than 6,000 pounds maximum weight and/or VSO more than 61 knots: the single-engine rate of climb in feet per minute (fpm) at 5,000 feet mean sea level (MSL) must be equal to at least .027 VSO 2. For airplanes type certificated February 4, 1991, or thereafter, the climb requirement is expressed in terms of a climb gradient, 1.5 percent. The climb gradient is not a direct equivalent of the .027 VSO 2 formula. Do not confuse the date of type certification with the airplane’s model year. The type certification basis of many multiengine airplanes dates back to the Civil Aviation Regulations (CAR) 3. 6,000 pounds or less maximum weight and VSO 61 knots or less: the single-engine rate of climb at 5,000 feet MSL must simply be determined. The rate of climb could be a negative number. There is no requirement for a single-engine positive rate of climb at 5,000 feet or any other altitude. For light-twins type certificated February 4, 1991, or thereafter, the single-engine climb gradient (positive or negative) is simply determined. Rate of climb is the altitude gain per unit of time, while climb gradient is the actual measure of altitude gained per 100 feet of horizontal travel, expressed as a percentage. An altitude gain of 1.5 feet per 100 feet of travel (or 15 feet per 1,000, or 150 feet per 10,000) is a climb gradient of 1.5 percent. There is a dramatic performance loss associated with the loss of an engine, particularly just after takeoff. Any airplane’s climb performance is a function of thrust horsepower, which is in excess of that required for level flight. In a hypothetical twin with each engine producing 200 thrust horsepower, assume that the total level flight thrust horsepower required is 175. In this situation, the airplane would ordinarily have a reserve of 225 thrust horsepower available for climb. Loss of one engine would leave only 25 (200 minus 175) thrust horsepower available for climb, a drastic reduction. Sea level rate of climb performance losses of at least 80 to 90 percent, even under ideal circumstances, are typical for multiengine airplanes in OEI flight.